Shortcake (Shotokeki) is a Japanese layered sponge cake with strawberries and whipped cream. I bought the teacup-shaped silicone molds set on sale and it was only 500yen (5 bucks)!!! 2. Place the chilled heavy whipping cream in a bowl. Whip the cream with an electric mixer until it forms a stiff peak. 3. In a different bowl, place eggs and sugar. Then beat them with an electric mixer until white and fluffy. 4. Add the cream (2.) into the egg mixture (3. ), and mix well with a wire whisk. 5. Sift in flour and baking powder. Gently mix with a wire whisk or a spatula until combined. 6. If you are using silicone cupcake molds (cooking sprays may slightly discolor the mold), lightly oil each mold. Then spoon the mixture into the cups up to 80% full. Bake at 180C (350F) for 20-25 minutes. 7. Place the cakes on a wire rack to cool completely. 1. Mix granulated sugar and hot water until dissolved. Then mix rum (if you like). 1. Gently brush the cupcakes with syrup. 2. Combine heavy whipping cream, granulated sugar, vanilla extract, and rum (if you like) in a dry, clean bowl. Float the bottom of the bowl in ice water, whisk the cream until it forms a soft peak. 3. 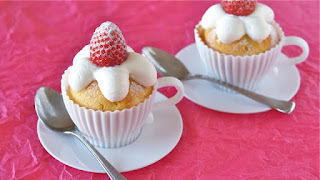 Transfer the whipped cream to a pastry bag fitted with a round tip (or snip off the end), then pipe it onto the cupcakes. 4. Garnish with strawberries, and sprinkle with powdered sugar. You can store cupcakes in the fridge for up to 3 days. But decorate them before you eat them.